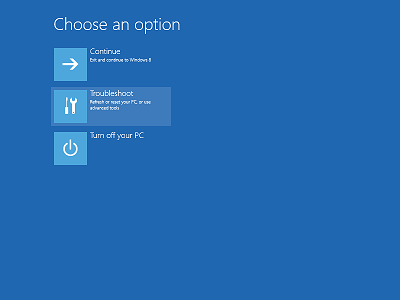 In Windows 8 and 10, you are supposed to be able to press the Shift+F8 key combination to achieve a similar effect (although you would not find the black-and-white start menu there), except that the window of opportunity for the Shift+F8 keys is much shorter now and it may take you a few restart attempts to press it at just the right time. When you are done using the safe mode, just restart Windows, and it should boot into its normal mode, as usual, without any additional intervention from you. 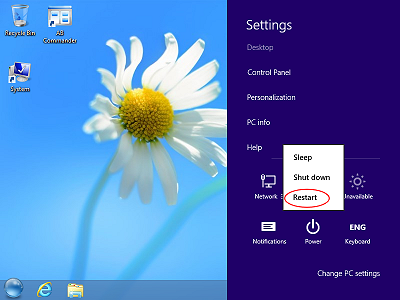 Press OK, and you may be prompted to restart Windows. You can do it right away, or after some time, but from this point on, whenever you restart Windows, it should boot into the safe mode. 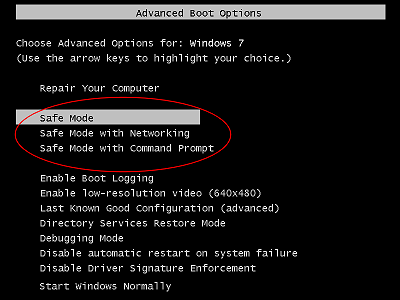 How to disable the automatic reboot in the safe mode that we've set up above? 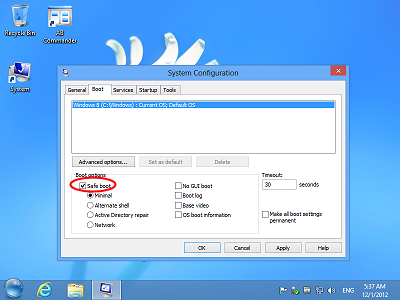 Open the System Configuration utility, and deselect the Safe boot option. 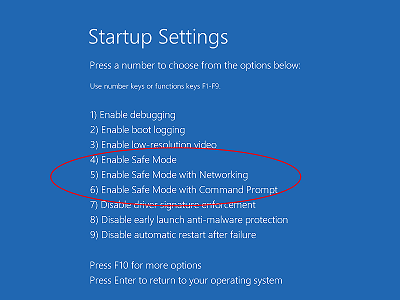 Keep in mind, though, that if Windows is restarted in the safe mode, the StartFinity icon may not be loaded automatically for you, but you can still start it manually using the StartFinity tile on the Start Screen, and then navigate to the System Configuration command as described above. 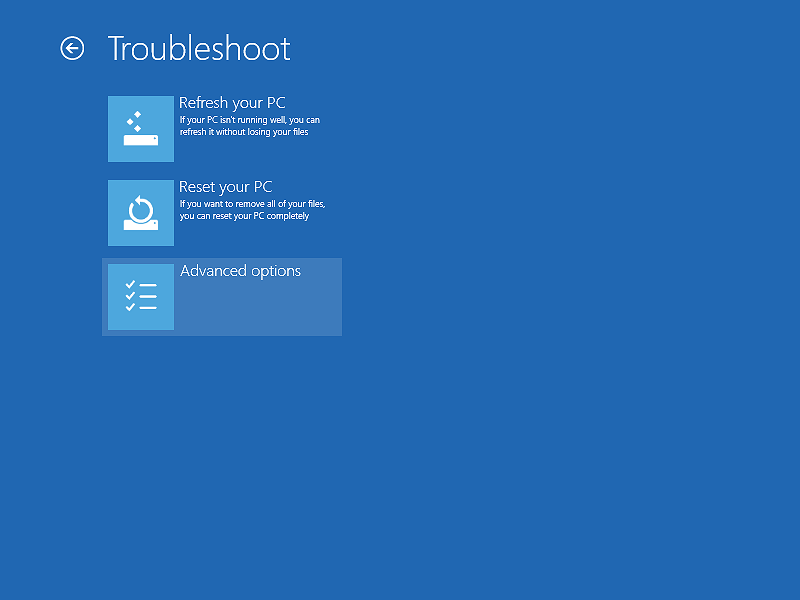 This should make Windows 8 and Windows 10 display the old-style black-and-white boot menu, instead of the fancy new one. An update: If you have one of the latest builds of Windows 10, then it probably uses PowerShell instead of the regular command prompt. In such a case, the above command will NOT work! It must be entered into the "old" command prompt window, not into the PowerShell one. 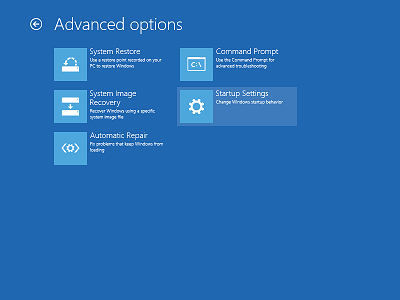 Click on the Windows Start button, and while the Start menu is displayed, start typing "cmd" (without the quotes). As soon as you type it, it should show Command Prompt as the best match. Press the Ctrl and Shift keys simultaneously, and while keeping them depressed, press the Enter key. This should launch the "old" command prompt "as administrator". We've just released an updated version 8.5 of AB Commander file manager. This version was submitted to the Windows 8 Application Certification and we are happy to report that it passed the tests and is now officially compatible with Windows 8. The Duplicate Current Tab command, the tooltips that show the full path, and the tabs, and several other improvements. A new option: Invoke Go to Parent folder when double-clicking on empty space. The horizontal scroll bars now automatically appear or disappear as needed on the Folder bars. As before, AB Commander 8.5 comes with a free 30-day license for you to try it out before purchasing it. WinAbility Software has released StartFinity, a Windows 8 program that adds a Start button to Windows 8 desktop. 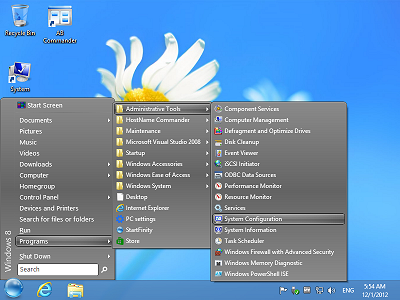 When the Start button is pressed, StartFinity displays the Start Menu similar to the built-in Start menu of Windows 7 and earlier versions of Windows. StartFinity enables Windows 8 users to utilize the familiar Start Menu interface to navigate to the Documents, Pictures, Music, and other folders, launch programs from the Programs menu, open Control Panel, or use the Shut Down menu commands to perform such tasks in a familiar fashion. “While not the exact imitation of the Start Menu that Windows 7 has, StartFinity comes pretty close,” says Andrei Belogortseff, the founder and CEO of WinAbility Software. 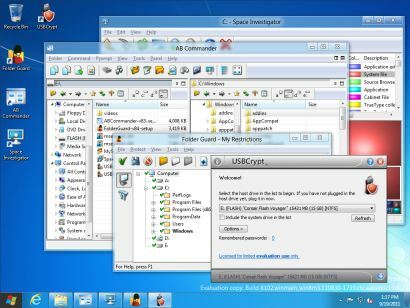 “The StartFinity Start Menu even comes with a search box where you can type a few letters of a program’s name you are looking for, and the matching items will be displayed as a list, for the user to choose from, pretty much like the Windows 7 search box does,” Andrei added. 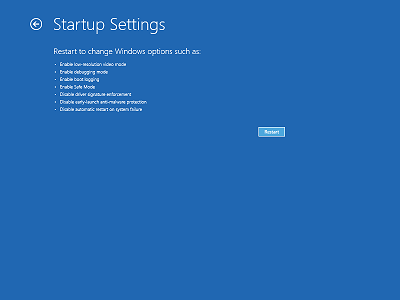 StartFinity does not remove access to the new Start Screen of Windows 8: it adds a command at the very top of its Start Menu to allow the user to switch to the Start Screen at any time. The user has also an option to use the Windows key to activate the Start Menu (instead of clicking the Start button). StartFinity can be used with both desktop and tablet computers running the Windows 8 operating system that offers the desktop mode. StartFinity cannot be used on Windows 8 computers that do not offer the desktop mode. The full version of StartFinity can be purchased securely online from http://www.winability.com/ starting from $7.95 for a one-computer license. Multi-computer and site license discounts are available. StartFinity Starter edition is also available for free download from http://www.winability.com/startfinity-free/. For more information, visit http://www.winability.com or contact WinAbility Software at P.O. Box 630272, Rockville, UT 84763-0272. Voice/FAX: +1(801)303-7310. Editorial Evaluation Copy Available on Request.